You probably know that cauliflower rice is an amazing swap for starchy carbs, but you may not know all the creative ways it can be used. Here are 6 clever ideas for incorporating cauliflower rice into your life. Before we start, get familiar with a quick tutorial on how to make cauliflower rice! You can also buy it pre-made and just cook until tender. Now you have a base for all the deliciousness coming your way. 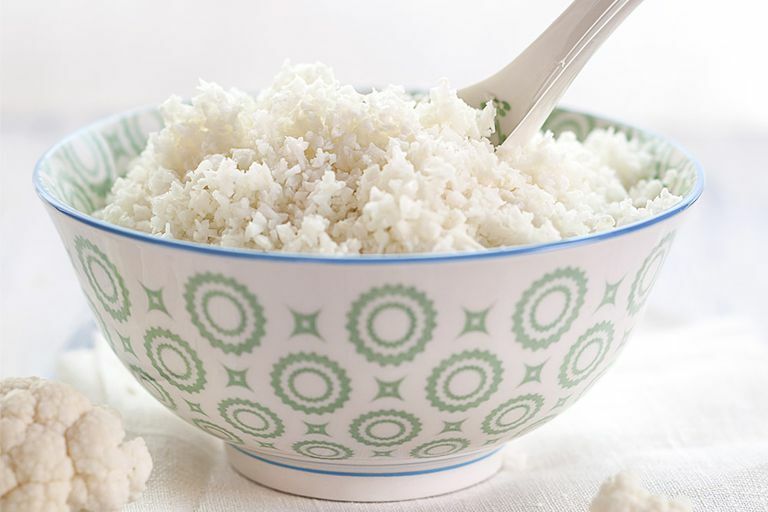 Cauliflower rice can be used anywhere you’d use regular white or brown rice, including casseroles! The comfort-food classics are typically packed with starchy carbs, but not when you use cauliflower rice. Swap out traditional grains and even pasta for the cruciferous veggie. We love building a baked dish by combining it with broccoli, chopped chicken breast, and a mix of light cheeses. I’ve always thought it was a little silly to add carbs to a meal that’s already wrapped in carbs. Including cauliflower rice in a burrito is the perfect solution: You get the texture and mild taste of rice, but without all the calories. Plus, it goes great with just about anything. Try it in a traditional Mexican burrito or a Chinese chicken wrap. What a fun twist on a traditional lunchtime meal! This is a good one! Pizza crust made from cauliflower is one of the best healthy-eating hacks around, and it’s a lot simpler than it sounds. Toss the cauliflower rice in a food processor, and reduce to coarse crumbs. Then nuke it and press out as much moisture as possible. Mix with egg whites, light cheese, and seasonings; form into crust, and bake until browned. Voila! Now you have the perfect vehicle for all your favorite pizza toppings. Sauce, part-skim mozzarella, fresh basil, turkey pepperoni—the list is endless. That's one of several low-carb ways to satisfy a pizza craving. Fact: Fried rice is delicious. Also true: It's typically an oily mess that's overloaded with calories. But not when you make it with cauliflower instead of rice and skip the whole frying it in oil thing. Just cook up some cauliflower rice with onion, frozen peas & carrots, garlic, teriyaki sauce, and a touch of sesame oil. Now you’ve got yourself a nutritious and delicious fried rice alternative! Speaking of Chinese food, cauliflower rice is the ultimate swap for sticky white rice for when you order Chinese food. And if you order a saucy dish, there's usually plenty of sauce to go around, so skip that rice and stir in some riced cauliflower! Your meal will be more filling, and the calorie count will barely increase. How about a nice chicken and rice soup to replace classic chicken noodle? Cauliflower rice fills out a slow-cooked soup perfectly. Just add it during the last 20 minutes or so of cook time. It's so easy, which is why we love healthy slow-cooker recipes. How Can You Eat Healthy Asian Food on the South Beach Diet?